"We'll figure Velvet Revolver out next month"
It's holiday time in the Slash household. But while the top-hatted guitar icon admits that he's very much into the spirit of the season, he's content with leaving the mistletoing and other such festive plans to his better half. "Holiday-wise, I didn't really do much this year," he says, chuckling. "I just wanted to relax because I've been on the road so much. But my wife decked the house out to the nines, and she did an amazing job. We're probably just going to have a quiet time around here with the kids. Dinner, hanging out - a real 'at home' kind of thing." Slash's laid-back attitude also extends to another holiday tradition, that of making New Year's resolutions. According to the guitarist, he doesn't believe in them. "I've found that they can put way too much pressure on things," he says. "Put it this way: I have certain goals and things that I'd like to achieve next year, but I'm also prepared for shifts and unexpected things to happen, as is always the case. So what I try to do is stay focused on the right direction and hope that things go according to plan." 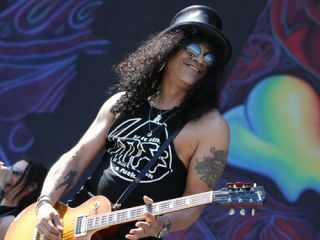 And make no mistake, Slash has big plans for 2011. First up is a US arena tour with his good friend Ozzy Osbourne, a 21-date trek that will see Slash and his band (which includes Alter Bridge's Myles Kennedy on vocals) opening shows for the metal legend. After the Ozzy run, Slash and Kennedy will continue playing dates, on and off, throughout much of the year. At the same time, guitarist and singer will begin work on Slash's next solo album, which may or may not be a true solo record in the absolute sense. And if that weren't enough, things are finally percolating once again in the land of Velvet Revolver. After years of dormancy and an extended search for a singer to replace Scott Weiland, it looks as though the band could be back on track. MusicRadar spoke with Slash yesterday. It was 9am in Los Angeles - not exactly rock 'n' roll hours by any stretch - but the guitarist was brimming with energy and happy to hold forth on a variety of topics, including the current state and future of Velvet Revolver, the Ozzy tour and what he sees as a continuing musical partnership with Kennedy. Matt Sorum was recently quoted as saying that Velvet Revolver had finally found a singer that you all "really like a lot." He described the vocalist as a "known guy, younger and stronger," but stressed that things were in the "dating" stage. Is this indeed the case? "Never believe what you read. [laughs] Here's what's happening: things have been moving in a very positive direction, and we'll know exactly what we're doing next month." OK. But do you think you might have found the right person? What with you touring behind your solo album this past year, along with Duff McKagan's brief stint in Jane's Addiction, is there still a strong band vibe in Velvet Revolver? Do you guys have material? "Yes! Yeah, there is. We've kept in touch and wrote a lot of great material and did a lot of stuff that's been pretty much under the radar. We also tried out a lot of singers. It's all good. We rehearsed a bunch this past month, during the last few weeks of December. The band vibe is great." But what would have happened if Duff stayed in Jane's Addiction? I imagine that would have complicated matters for Velvet Revolver. "If he had stayed in Jane's Addiction, which I don't think was his plan in the first place, but if he did…I wouldn't continue Velvet Revolver without him. It would have been on indefinite hiatus." What was the situation with Myles' name being floated around as a new singer for the band? "Apparently, it happened twice, once before Scott was in the band. Myles was still in The Mayfield Four - Matt had mentioned him, and I didn't know who he was. I guess we had sent him some music, but Myles never responded - he got cold feet. More recently, his name came up again. There was a lot of talk in the press because of the Zeppelin thing, so that's when I really became aware of him, and it prompted me to want to check him out. I looked him up on YouTube. But he wasn't interested in leaving Alter Bridge, which would have been the only way he could have pursued a future with Velvet Revolver. "A year later, I called him up about doing two songs on the solo record. I thought, Hey, what about that Alter Bridge guy? [laughs] It was a shot in the dark. And then it all developed into a whole relationship. Myles is one of the most phenomenally gifted lead vocalists that I've heard from anywhere in the last 10 years." Did you ever ask him outright to be in VR? "No. I know a lot of people talk about it. But I don't think that people really consider that he's already in a band." I know things are in a very embryonic stage, but musically, can you think of how you want this next record to differ from past Velvet Revolver albums? "Velvet Revolver with Scott was very cool and interesting. Recently, I had to listen to one of the records to relearn one of the songs. I'm very proud of what we did, and of working with Scott in a lot of instances. But it was never heavy enough; that was my big issue with it. The band had to kind of acclimate to Scott's style, which was cool. But the one thing that was lacking, in my mind, was a certain Matt-Slash-Duff approach, and that got sidelined when we started working with Scott. The new songs we've written are us doing our natural thing, and they sound really good. I'm looking to maintain that spirit, and we're looking for a singer to fit on top of that." Let me ask you about opening for Ozzy. Does it feel weird not to be a headliner? You haven't been second on a bill for years and years. "Well, yeah, I have. [laughs] All things considered, we're doing these shows with Ozzy, and then between those gigs we're doing our own shows on the side. But opening for Ozzy is something I really wanted to do. We're good friends, it's a good bill, and it's something I've never done before. It sounds like fun! [laughs] I've never opened for Ozzy before. I've played a lot of gigs with him, so I'm really looking forward to this." On your album, Ozzy sang on the song Crucify The Dead. Can we assume he'll show up on stage from time to time to sing it live? "I don't know, it's hard to say. I think we're possibly going to be doing it in the set anyway, so…knowing Ozzy, that'll probably whet his appetite to come out and do it during the tour. We'll have to see." Conversely, has it been discussed whether you'll go out and join Ozzy on a song or two? Are there any songs from the deluxe edition of your album that are going to be played live? Or do you have to keep the set pretty tight? "It's only an hour-long set, so…let me think…I would imagine we'll do some songs from the deluxe album because some of the songs are the same. [laughs] It's going to be a pretty tight set, with mostly stuff from the album, some cover songs, a Snakepit song and maybe a Velvet Revolver tune. During the side gigs, that's when we can do a more comprehensive set." What's happening with your next solo record? From what I understand, you're not going to have multiple singers - Myles is going to be the sole vocalist. "Yeah, but in this instance, when we say 'solo record,' it's not going to be so much a solo record because I'll collaborate with Myles on it, and we'll sort of do it together. But it'll be another record offset from the regular Velvet Revolver fare." If it's a collaboration with Myles, is this going to be the start of another band? "As it stands right now, I'm going to use the same band that I took on the road, 'cause they're awesome." But will the record be billed as "Slash"? "I don't know, we'll see." Again, I know it's early to talk about, but aside from having only one singer, what would you like to do differently on this next record? "I'm writing now and recording demos. On the first record, I only worked with Myles on two songs, so we'll have to see how it goes doing a whole album together. It's sort of a springboard for me to do whatever I feel like doing. That's one of the beauties of doing a solo record - you can do whatever comes to mind, and there's nobody to deliver the songs to for approval. But I do have to play stuff for Myles and see what he's into. I can guarantee that it'll be very musical. Myles is a great guitar player, and he's a great songwriter. We'll see how it develops. I'm just putting ideas together. I might deliver them in full form or I might send him the basic ideas." Is it sometimes hard to differentiate riffs as you come up with them? You know - "Revolver gets this riff. Solo stuff gets that riff." "The solo stuff, as it stands right now, I sort of make it up with Myles in mind. For Velvet Revolver, I come up with the stuff when we're in a room together. We all collaborate, so it's more of a spontaneous kind of thing." How do you work on demos? What kind of gear do you use? "I just put together a small Pro Tools studio in my house. On the road, I'm going to try to use my Mac, 'cause it's got a function for it and I've never used it. Apparently, there's a Pro Tools program that I can use - I haven't explored that yet, though. Up until now I've been using a little Zoom recorder." Live, are you going to be using any of the new Epiphone Appetite For Destruction models, or are you sticking with USA and Custom Shop guitars? "No, I have the Custom Shop Slash models on the road. Actually, I have a couple of Custom Shop and USA models and some Slash goldtops." The Les Paul has always been your go-to guitar, but you played a Paul Reed Smith recently at an Alter Bridge show. [Slash laughs] Do you ever play other makes and models at home or in the studio? "Not really. I mean, I have a Strat which I've been known to pick up for certain things in the studio. At home and in most studio and rehearsal situations, I always use a Les Paul. It's a no-brainer - I never even contemplate using anything else." Why is that? I'm curious: what is it about the Les Paul that you love so much? How much do you practice the guitar? Every day? And are there still things you hear in your head that you just can't nail? "If there was anything in my head that I couldn't nail, well, that wouldn't happen because I'd stay at it until I did nail it. This is a good question, actually. The truth is, I don't sit and practice what a lot of people do - you know, scales and certain techniques. "What I do is, I play a lot. And in playing, I discover things, and I work on those things until I can execute them. I might hear something in my head, like you said, and I'll go and start messing around until I can get it right. I'm more of a player than a practicing guitar player. But I play constantly, as much as possible. For instance, I was gone for a couple of days, and the first thing I did when I got home was pick up my guitar. A lot of times when I'm traveling or doing whatever, I'll even go up and jam with club bands, so I've constantly got a guitar in my hands - as much as possible, at least." Do you find that you get rusty if you don't play for a day or two? Do you ever get those happy accidents while playing the guitar? You'll find yourself playing a riff or getting a new sound and you'll be like, "Wow, I didn't know I could do that!" "That happens a lot, especially because I play live a lot. When you're sort of in the zone during live performances, you stumble on all kinds of things you hadn't planned on doing. You can surprise yourself. That's one of the beautiful things about improvising and performing live, that energy that goes along with it, which is very creative. Believe it or not, it's actually one of the most creative platforms [laughs]. Even though you might be playing a bunch of set material, if you play loosely enough, you'll stumble onto things. "I find that when you're trying the least, when you're not trying to come up with something cool, that's when you're going to stumble onto something. So that's why I always try to have a guitar around, because you never know. A minute that you're not playing the guitar is a minute when you're not coming up with something cool." Looking at 2011, how do you envision your plans chronologically? The record with Myles first? Velvet Revolver first? How to do see things lining up?